Is C. diff (Clostridium difficile) Contagious? How Is It Spread? What facts should I know about C. diff (Clostridium difficile)? How do I know if I have an infection caused by C. diff? How will I know if I am no longer contagious for C. diff? When should I seek medical care for C. diff? What is the medical definition of C. Diff? Clostridium difficile or C. diff is a bacterium. Microscopically it is referred to as gram positive and rod-shaped. It is exists best in a low oxygen environment. It was first described in 1935, and is considered one of the most common causes of infections in the colon. Clostridium difficile is also referred to as C. diff and C. difficile. How contagious is C. Diff to a healthy person? C. diff can be found in uninfected persons. However, people taking antibiotics are risk of becoming infected with this bacterium as antibiotics disrupt the normal bowel bacteria and allow C. diff to grow rapidly (proliferate). The growth of C. diff in the colon leads to inflammation of the colon (colitis, specifically pseudomembranous colitis). Adults aged 65 years and older are at higher risk to become infected. Yes, C. diff is contagious. Microorganisms can be spread from person-to-person by touch or by direct contact with contaminated objects and surfaces (for example, clothing, cell phones, door handles). Some individuals are carriers of this bacterium but have no symptoms of infection. However, these people are still infected with the bacteria can spread the infection to others. especially individuals that are hospitalized, and are being treated with antibiotics that suppress the normal bowel flora. Avoiding direct and indirect physical contact with contaminated areas reduces the likelihood of contagion. Although the incubation period for Clostridium difficile is not precisely known, researchers suggest that the incubation period is about seven days if the conditions are favorable for bacterial proliferation. However, a person may acquire C. diff and develop no infection symptoms, but be colonized for extended time periods (years) until conditions develop that favor C. diff proliferation. Symptoms of C. diff infection can be mild such as watery diarrhea three or more times a day with mild abdominal pain or tenderness or maybe more severe with diarrheal episodes reaching 15 times a day with severe abdominal pain, blood or pus in the stool, fever, weight loss and loss of appetite. In most instances, the confirmatory diagnosis is made by detecting a cytotoxin produced by C. diff in the patient's stool sample. As described above, Clostridium difficile can be spread from person-to-person by direct contact and indirect contact with contaminated objects (clothing, eating utensils, and tabletops, for examples). 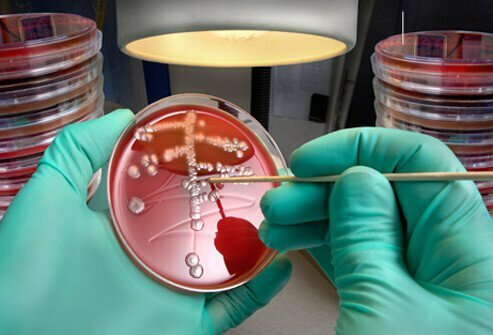 C. diff spreads easily in hospitals because often the highest concentrations of these bacteria are in hospitalized patients treated with antibiotics. Strict hand washing techniques and patient isolation methods can reduce C. diff spread in hospitals and other areas. People infected with C. diff who become ill usually are treated with special antibiotics (metronidazole (Flagyl), vancomycin (Vancocin), rifaximin (Xifaxan) and/or fidaxomicin) for about 10 to 14 days. Severe infections may require intravenous antibiotics and even surgery. A person with C. diff becomes less contagious as the symptoms decrease, and little or no toxin is detected in their stools. However, since the person previously infected is still capable of relapsing and/or becoming a carrier for Clostridium difficile, it is difficult to say if the they are no longer contagious. However, the person is less likely to transfer C. difficile to others when their symptoms resolve after treatment. If you or someone you know develops mild to moderate watery diarrhea, cramping abdominal pain, anorexia, fatigue and fever, especially after taking antibiotics, seek medical care. If you or someone you know is dehydrated, has a fever, decreased bowel sounds and/or abdominal rigidity, and possible perforation of the colon with a very tender abdomen, you or they should seek immediate emergency medical care. Hospitalized patients on antibiotics are monitored for signs and symptoms of C. diff infection including diarrhea and abdominal pain. Centers for Disease Control and Prevention. Clostridium difficile Infection. Aberrra, FN., MD. "Clostridium Difficile Colitis. Medscape. Updated: Apr 06, 2017. Please share your experience with C. diff (Clostridium difficile) infection. What symptoms did you have with C. diff infection? How was your case of C. diff treated?